hosted by Sally over at The Studio Sublime. Sally challenged us for find beauty in the midst of winter. "Let's get out of the winter rut! Let’s create a beautiful piece of jewelry inspired by Winter! The beautiful shimmer of new fallen snow. The muted colors of nature as it awaits Spring. The yummy browns of that hot cocoa you slowly sip to warm your bones. The deep greens of the evergreens. and the bright red berries from the holly bushes. Well, having spent New Year's in the White Mountains of Arizona and after also having a week of 21- 32 degree temps in the desert (that's kinda rare for Phoenix! ), the snow and ice scenes were still fresh in my head! The fountain in our backyard froze over a couple of weeks back! 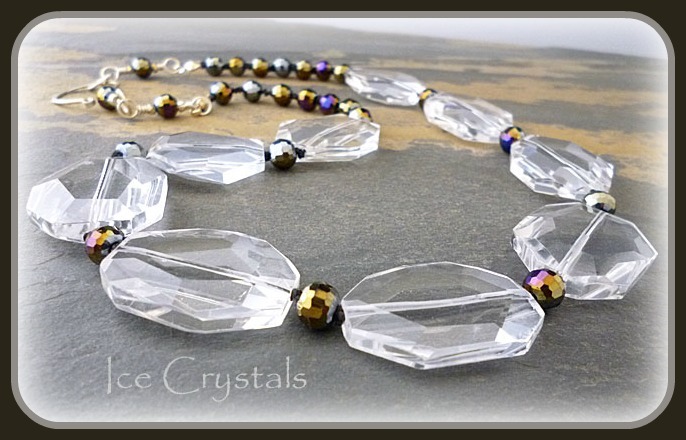 So, I created "Ice Crystals"
The colorful faceted crystals remind me of the beautiful colors that still remain; greens, golds, blue/greys, etc., and the clear quartz crystal slices remind me of all the icicles. I hand knotted some large, faceted, clear quartz crystal slices and some fancy, faceted glass crystal rounds together on black silk and then finished it with one of my hand crafted, sterling silver claps. Thanks so much Sally for offering up this wonderful Winter Inspired Challenge, it's been a creative way to view the season! 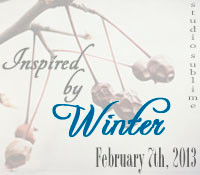 Hop on over and see what everyone else has created for the Inspired by Winter Challenge, won't you? Peace, Love and Winter Wonders! That is a wonderful necklace. I love how the colors on the glass contrasts with the clear crystals. That is definitely a show stopper. What a beautiful necklace! You've captured the look of the icy fountain perfectly. I lived in Phoenix for a short time, and I would have been very surprised to see ice there! Crazy! Love the "ice". It really does show a winter feel! Awesome piece! I really like how the colored beads look with the transparent faceted crystals and also like that you knotted the necklace with black silk. Such an unusual combination of colors, and works so wonderfully together. Love the clear flat crystals! And thanks for show us your fountain of icicles! Imagining you were shocked and delighted at the same time when you saw it. LOVE your fountain pictures! And your pieces is very wintery, love the pop of color from the pearls too. I love how your story and necklace go together.. very beautiful. Shelly, WOW! 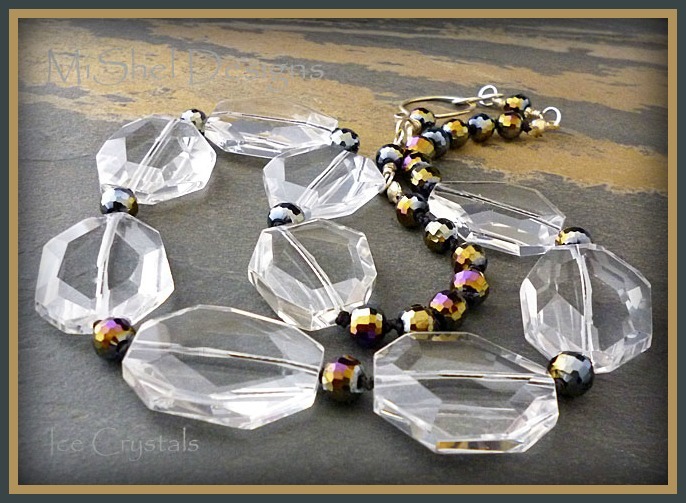 I love the big crystals you used and the jet black AB beads are the prefect accent. It's funny because you wouldn't think that you would use black in a Winter inspiration, but it was one of the first colors I was playing around with too. I think that it represents the sparkles and prisms of the icicles perfectly! Thank you for participating in the hop!! Deliciously icy... I love it! This is beautiful! I have seen a few pieces in this challenge where the designer chose quartz - and I just love how mimics ice! I agree with Tanya - the glass boldly contrasts with that quartz, creating such a beautiful affect! 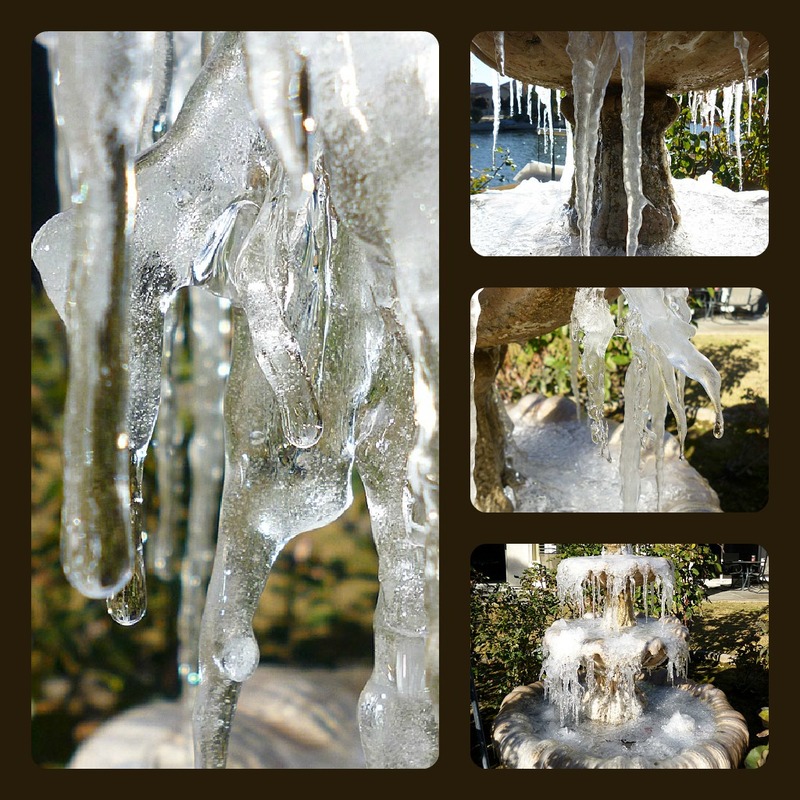 Very cool pics of your fountain, too! Hope you enjoyed the Gem Show! I love your necklace it is beautiful! It is so like the pictures of your frozen fountain. It almost looks like it would be cold to touch. I love the picture of your frozen fountain and your necklace is perfect. I love hand knotting. Lovely, I think it captures the icy scene perfectly. This is beautiful! Love the metallic beads!! Stunning necklace Shel! I bet it looks fantastic on! Lovely work! The colourful glass is a great contrast against the iciness of the crystals. The fountain photo is amazing.. don't think it ever gets that cold to do that here. The necklace is such a good choice of beads..I love the little dash of colour to light those icy slices up.. beautiful job. The crystal is so perfect, and so stunning. I love the simplicity of your design that lets it remain in center stage!